I understand that this problem might be simple geometry, but Im using specific shapefiles for a geographical area and looking for a specific gis solution (hopefully code). Essentially Id like to find the area of black that covers each separate geographical bounds. What percentage covers the red area, blue area, and then green? I have coordinates of the center, as well as shapefiles (.shp). The radius is known. No preference on library other than it being open source (R and Python). 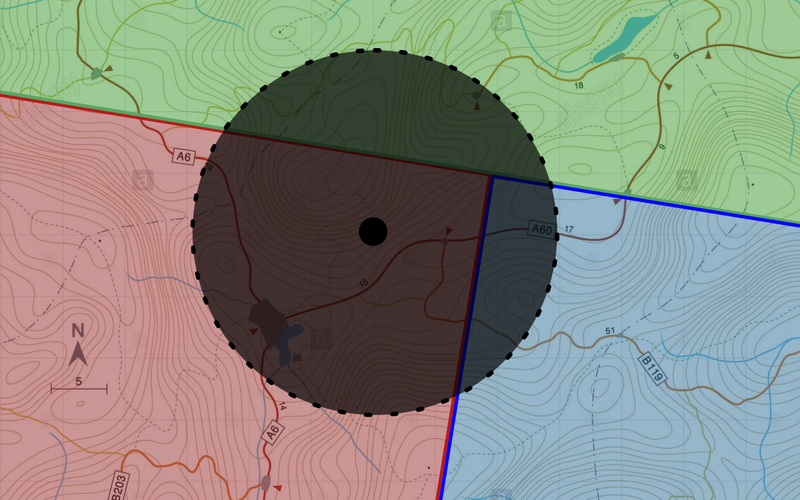 Browse other questions tagged python shapefile r polygon geofencing or ask your own question. Is it possible to implement Geofencing in Openlayers? Analyzing spatial distribution of invasive specie across landscape? Geofencing (Leave/Enter geofence Timing) Issue? Creating polygon grid from SpatialPoints in R?